By very special arrangement, we are excited to reveal that the Evel Spirit rocket-powered Skycycle will be the featured attraction at the Boise Roadster Show. Set for March 10th thru 12th at Expo Idaho, this marks the first public appearance of the ride that helped successfully propel Eddie Braun over Snake River Canyon. As most remember, it was 42 years ago that the legend of Evel Knievel attempted to jump the canyon, but failed when his chute deployed shortly after take off. He would never make another attempt to avenge that disappointing day in 1974. On September 16, 2016, Eddie Braun achieved a childhood dream, successfully jumping the awe-inspiring canyon. Remarkably, the launch took him a little over 3 seconds to hit 430 miles per hour. A carefully planned parachute deployment helped land him nearly mile from his original starting point. The O’Reilly Auto Parts Boise Roadster Show presented by Les Schwab Tires returns to Expo Idaho. The 45th show is aligned with the Summit Show Car Series as a key stop in the ISCA tour. Show hours are: noon-10 pm on Fri., 3/10; 10 am-10 pm on Sat., 3/11; and 10 am-6 pm on Sun., 3/12. Adult admission is $10, kids 6-12 $3 and 5 & under free. 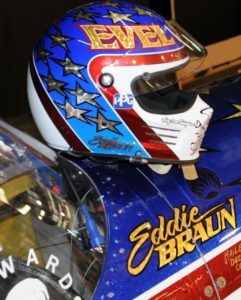 We are honored to not only have Evel Spirit Skycycle on display, but the acclaimed Hollywood stunt man Eddie Braun is planning a trip back to Idaho to share his story with fans at this year’s show.